Just Juice is taking a trip across the Atlantic for this year’s Halloween celebrations and visiting the sights and sounds of the Mexican ‘Day of the Dead’ carnivals. This fiesta traces its beginnings all the way back to the Aztecs and the Mexicans and our south American counterparts have been showing us how it’s done ever since. 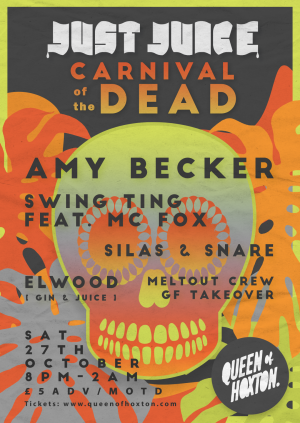 You can expect the usual crazy décor and over the top production you’ve come to expect from Just Juice and Queen of Hoxton teams on Halloween plus lots of spooky surprises. Musically speaking, we are hyped to announce that we have two amazing guests stepping up to the booth in the form of, Amy Becker (Acrylic) and Swing Ting Feat. Fox. They will be leading the parade in the basement which will be hosted by residents Silas & Snare. It’s safe to say, we are expecting more of the usual bass heavy carnival riddims provided by our resident duo and their heavy weight selection of guests. On the ground floor you will find Just Juice frienda Melt Out Crew hosting with their carnival brand of Hip-hop, Garage, Dub, House and more. While in our new room, Gin & Juice resident Elwood, providing a mix of party music. So, Don your finest freaky frocks, paint those Candy Skull faces and, well, dance the floor to death.